Bishop Michael Fitzgerald, top row second from left, poses with the six recipients from the Philadelphia Archdiocese of the NCEA’s Lead Learn Proclaim Awards April 19 in St. Louis. 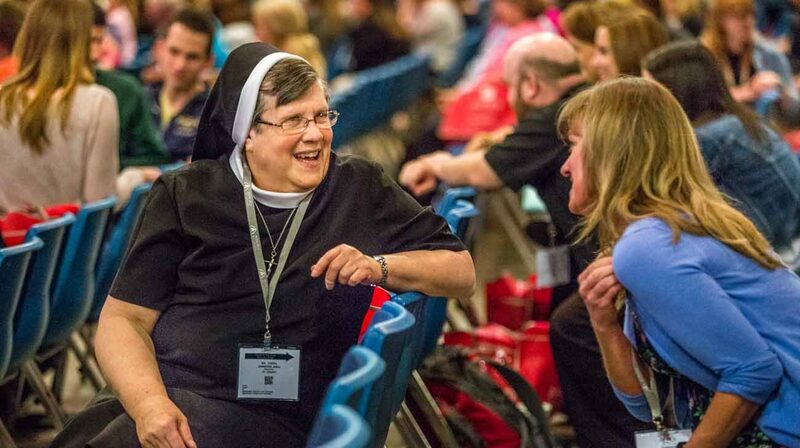 ST. LOUIS (CNS) — More than 8,000 Catholic educators attended the April 18-20 National Catholic Educational Association Convention in St. Louis this year and many of them picked up ideas during the gathering to use in their own schools. She attended a workshop that she said gave “really good insights” on St. John Paul II’s encyclical on an integrated vision of the human person. As a first-time participant, she was worried the convention wouldn’t offer enough for those who teach the younger children. But that wasn’t the case. She also said she found a lot of similarities in Catholic education on the mainland U.S. and her island nation, a U.S. territory in the Pacific Ocean. 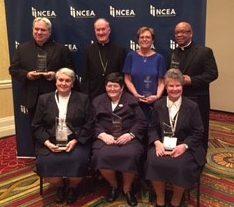 Six educators from the Archdiocese of Philadelphia were among the 41 recipients nationwide who were awarded the NCEA’s Lead Learn Proclaim Awards April 19. They included Father Joseph Maloney, pastor of St. Aloysius Parish in Pottstown; Father Stephen Thorne, pastor of St. Martin de Porres Parish in Philadelphia and chaplain for Neumann University; Audrey Neil, Kindergarten teacher at St. Dorothy School, Drexel Hill; Sister Stephen Anne Rodriguez, I.H.M., principal of St. Aloysius Academy for Boys, Bryn Mawr; Sister Edward William Quinn, I.H.M., director of curriculum and instruction, Office of Catholic Education; and Sister Rita Murphy, I.H.M., principal of St. Rose of Lima School, Philadelphia. At the opening session, Thomas Burnford, president and CEO of the NCEA, said that despite enrollment challenges, “Catholic education is alive and well” and Catholic educators are committed to growing in faith and learning from each other. “Catholic schools are places of encounter with the Lord,” he said. Keynote speaker Jonathan Doyle, who operates an online staff formation program in Catholic identity and Catholic teaching, reminded the educators that they need Jesus’ help in their work.